AiAiAi's new Discovery tool suggests headphones based on your Spotify playlist | What Hi-Fi? A clever tool from the modular headphone firm suggests the components, and the fit, to best suit your Spotify listening habits. Sometimes there's just too much choice. If you feel that way about AiAiAi's TMA-2 headphones, then help is at hand. The TMA-2s are modular, meaning you can swap in parts as and when you see fit, making them some of the most customisable cans around. But how do you make sure you've got the best set-up for the type of music you listen to? By using AiAiAi's new Discovery tool, that's how. As spotted by Engadget, the software analyses what's on your Discovery Weekly Spotify playlist, the music recommended to you based on your listening habits. 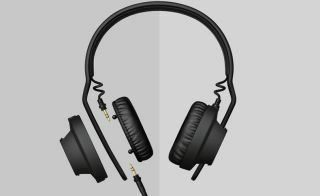 By recognising the genre, tempo and mood of the tracks, it will recommend the ideal headphone configuration. The software is provided by Moodagent, which specialises in this sort of thing. There's a percentage breakdown for each track, so you can see which ones are best suited to your sonic set-up. Once it has suggested the ideal configuration, you can buy the necessary headphone parts in just a few clicks. If you regularly listen to a wide range of music, that could get expensive. But it's still a cool way of optimising your headphones. And it provides a glimpse of how we might all be listening in the future.